This recipe works well with any type of kale and you can substitute the fresh and dried fruit with whatever is in season. We served it alongside spring rolls and rice the other night to 6 adults and 5 kids, but I would double the recipe next time for a group that large since it was eaten up quickly. Take 1 bunch of kale. Strip the kale leaves off the length of the stems and discard the stems. Cut the leaves into small strips. Put the leaves in a large bowl and sprinkle liberally with salt (more salt than you would want to eat–you are going to rinse it off later). Massage the salt into the kale for 1-2 minutes or until kale leaves look like they have been “cooked”. The salt removes the water and tenderizes the kale. Add water to the bowl to cover the kale, and let sit for 10 minutes or so. Drain the water and rinse the kale two more times with fresh water or until water comes off of the kale clear. It helps to squeeze the water out of the kale leaves as you go. 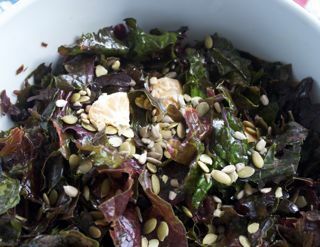 Dry the kale off well with a salad spinner or towel. Add olive oil, balsamic vinegar, orange, and dates. Stir well. Add pumpkin seeds on top and serve.